A Plan of the Bay on the South West Side of Pulo Timon. 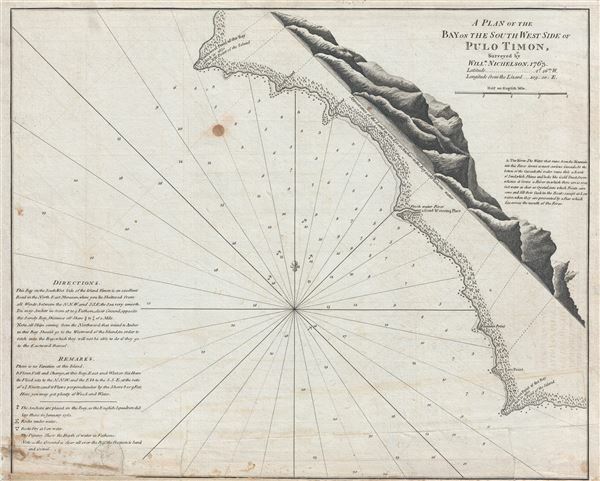 This is a fine example of Laurie and Whittle's 1763 nautical chart or maritime map of the Tionam Island or Pulau Tioman, located off the east coast of West Malaysia or Malaya. It covers the southwest side of Tioman Island from the Southeast point to the Northwest point of the island. The map offers rich detail including countless depth soundings, notes on the sea floor, commentary on reefs, rhumb lines, shoals and a wealth of other practical information for the mariner. A coastal profile view details the appearance of the land from the bay. Several annotations offer detailed sailing instructions and navigational tips. This map was based on the surveys of William Nichelson and published by Laurie and Whittle from their offices at 53 Fleet Street, London. Good. Original platemark visible. Some spotting. Lower portion of map exhibits some damage with extended margin. Some toning and verso repairs.